We got the Canadian bodybuilder on the phone to talk about his transformation from regular-size guy to competition-ready superhuman. Ivan Lumbera was always an athlete. 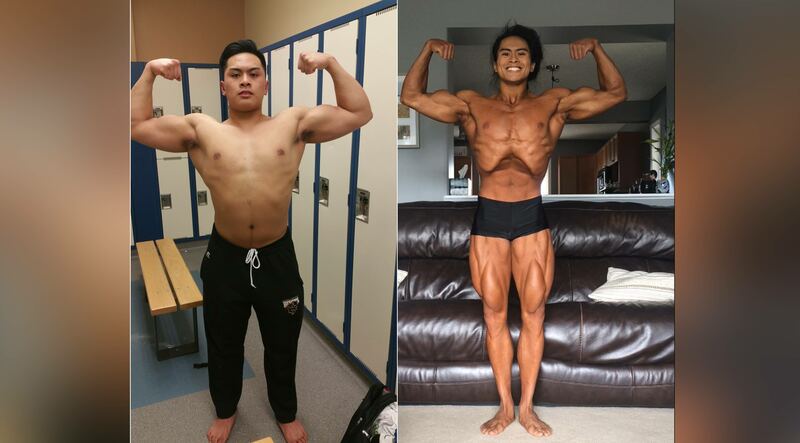 But the 21-year-old from Manitoba, Canada, never would've seen himself becoming a classic physique bodybuilding champion—until about two years ago. That's when Lumbera decided to start hitting the weights and changing his diet, all in an effort to build a physique that could stand up against the best bodybuilders in the country. Since his first bodybuilding show last fall, he's built a formidable physique—and proven that he's got what it takes to go far in the sport. 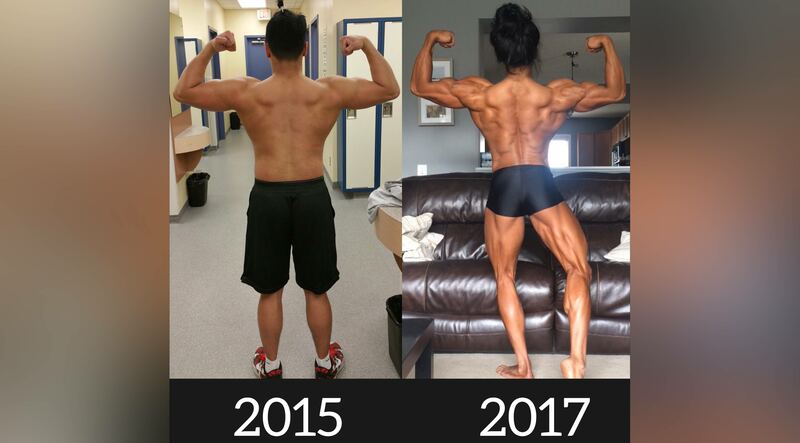 After winning gold at the Manitoba Amateur Bodybuilding Association Provinicial competition, he placed fifth at Nationals. When Lumbera first started hitting the gym regularly, he went pedal to the metal, he tells Muscle & Fitness. He took the mantra "no days off" literally, making time for a workout almost every day for the first year of his fitness journey. As if working out daily wasn't enough, he'd spend around 2 to 2½ hours in the gym training. He began in January, and his immediate dedication and all-in approach had him seeing results by April. Although he had a background in sports from high school, bodybuilding was new to him, and its novelty had him totally hooked—that sports background gave him the mental toughness to keep going, even when the going got tough. "I know that if I really want something, I have to work for it," he says. "At first, working out was painful, and even just the calluses on my hands were a barrier because it would hurt lifting dumbbells. Over time, you get used to it." The hardest part of getting started was staying consistent, Lumbera says. But as any successful bodybuilder knows, consistency is the key to success in the sport. His secret to maintaining that consistency is focusing on the long-term, and understanding that you'll only keep making gains if you keep staying dedicated to the routine. Nowadays, Lumbera spends no more than about an hour and a half in the gym, which he chalks up to using his time more efficiently and keeping gym chit-chat to a minimum. "When I’m in there, it’s business," he says. "Especially during a prep, people think I'm brushing them off. But during that time, you’re so mentally focused, and just want to go hard—there's no time to talk." Another key to Lumbera's success was learning to keep his form on-point in the gym, he says. At first, his back was his least favorite body part to work because, unbeknownst to him, he was spending too much effort engaging secondary muscles—in his case, the biceps—and not making the mind-muscle connection to hone in on the muscles that he couldn't see while activating them. Now, it's his favorite area to zone-in on. His go-to moves to build a show-ready back: barbell rows, pullups, dumbbell rows, and pulldowns. M&F Hers Which Diet Plan is Best for Bodybuilders? Here's everything you wanted to know about carb backloading, carb cycling, and IIFYM. Lumbera's first prep was a mere three weeks—most bodybuilders need three months—but he didn't let that get the best of his nerves. "I just worried about myself," he says. "I didn’t focus my energy on things that were out of my control or out of reach. I just stayed focused, and I even won X-Factor of the Night at that show." Even when he hit the stage at Nationals he had the same philosophy: do what you can, and don't focus on what you can't control. Aside from his presence onstage at competitions, he's building his presence on social media. "It's definitely different for me, and I'm learning as I go," he explains. "But I try my best to answer all of the messages I get and share tips with people whenever I can." While his accomplishments sound like the work of someone with all the time in the world to dedicate to fitness and nutrition, Lumbera definitely doesn't, considering the fact that he's also a college student with a few years to go before he can pursue his career in physical education. So, of course, he's got a few tricks up his sleeve to strike a balance between everything he's got going on—namely time management, which is where an average college student might just give up. But not Lumbera. "You have to make time for something if you want to make something happen,” he says. "Fitness has played a big part in my life, and I have to make time to meal prep and go to the gym, and keep up with the people I look up to on social media to keep that motivation, that fire, going." And he doesn't plan on putting that fire out any time soon. "I have a long road ahead of me," he says. "And I want to stay healthy mentally and emotionally. I don’t want bodybuilding to take over my life. I want a good balance." And, of course, he'd love to turn pro one day, but he's in no rush to do so. Taking it slow, maximizing his full potential, and picking up a few sponsors along the way is his game plan—no one would ever argue that balance is a bad thing. Follow Lumbera on Instagram @ivanlumberafitness to keep up with his progress. It only takes a few weeks to build a body that looks cut out of granite.